From a Simple Website to Full Web & Mobile Applications. Now Leading the way in ADA Testing. We believe design is an evolution of the imagination, through a work of technologically oriented art produced through creative effort. Capture Your - Clients Needs & Imagination! Full ADA Testing & Certification. With many years of software testing experience this practice has now become a priority for any company affected by the new 508 & WCAG 2.1 requirements PF Web Design offers a tried and "Tested" methodical approach to testing and Certification. Conformance to a "standard" means that you meet or satisfy the 'requirements' of that "standard". "With the new WCAG 2.1 standards the 'requirements' are the Success Criteria!" We are here to guide you through the standards your company's Website must reach! Our designs are flexible and powerful multipurpose custom built sites packed full of custom widgets and easy to use. This means that the design will adapt to mobile phones and tablets for a more intuitive browsing experience. PF Web Design explores revolutionary digital marketing approaches that elevate your brand. We specialize in web design, brand identity and digital strategy. 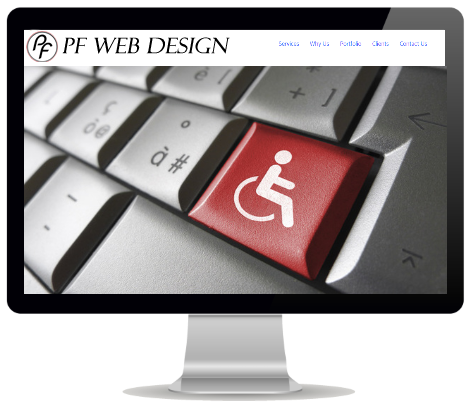 PF Web Design would like everyone who visits the www.pfwebdesign.com website to feel welcome and find the experience rewarding. We are working hard to provide accessibility to anyone with a disability under the Americans with Disabilities Act or similar law, if you wish to discuss potential accommodations related to this website, please contact us for Assistance at info@fullylove.com or call 941.224.7631. Please click on our ADA link to see what we are working on and issues being resolved immediately.